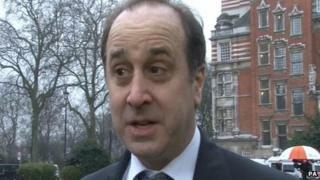 Tory MP Brooks Newmark has said he is seeking psychiatric help after new claims of him sending explicit photos. The Braintree MP, who is married with five children, also said he would stand down at the next election as the Sun on Sunday published fresh allegations. He wrote in the Mail on Sunday he had been "battling demons - and losing to them. I craved adrenaline and risk." He resigned as a minister last month after sending risque pictures to a reporter he thought was a young woman. That story was published in the Sunday Mirror. In the latest claims, the Sun on Sunday said it had discovered that Mr Newmark had sent "X-rated" pictures of himself to a second person. The newspaper claimed the 56-year-old sent explicit pictures to a "young mum". In the Mail on Sunday, the American-born MP said: "In response to what seems to be a new text-and-tell story I am standing down as an MP at the next election." He said he was a man "who had everything", but said his political career was now in "ruins", writing that he will go into residential psychiatric care for the next few weeks. "I have traumatised my family and let down my constituents and my colleagues," he wrote. "Many will regard me as a failure and it is true." He said "stress at work drove me to increasingly erratic behaviour" and that friends warned him he was "cracking up", but said he had ignored them. "Late at night, I began a series of flirtations in response to approaches from women on social media. Deep inside, I knew I was playing with fire. Now it has consumed me and my family," he said. He said he hoped professional help "will enable me to salvage my life and my family". Mr Newmark outlined his intention to leave Parliament in a letter to David Cameron, saying stories about his personal life had been placing "an intolerable burden on my family". "I again appeal to the media to respect my family's privacy and to give me a chance to try to heal the hurt I have caused them," he wrote. "I have no-one to blame but myself and take full responsibility for my own actions." Mr Newmark had entered Parliament in 2005 and was re-elected in 2010 with a majority of more than 16,000. He resigned as minister for civil society after it emerged he had sent sent pictures to a freelance reporter, who adopted the false identity of "Ms Wittams" and described himself on Twitter as a "twenty-something Tory PR girl". "Sophie" then contacted and interacted with a number of Conservative MPs via the social networking site. Mr Newmark's resignation as minister came on the eve of last month's Conservative party conference and just hours after Tory MP Mark Reckless said he was quitting the party to join UKIP. The Sunday Mirror, which published the original story, has apologised to two women after photographs they posted online were used by the fictional Ms Wittams. The methods used in the investigation have also been questioned by former judge Sir Alan Moses, the chairman of the Independent Press Standards Organisation (Ipso), who said the matter was of "urgent public concern".